I relentlessly mock socialism, in part because it’s such a target-rich environment. But I’m also hoping that humor is a way of debunking this wretched ideology. I’m worried, after all, that socialism may triumph thanks to a combination of “public choice” and diminishing societal capital. Today, let review the case against socialism. We’ll start with this short clip from a recent interview, where I recycled my argument that greater levels of socialism produce greater levels of economic misery. I now have some new evidence on my side, thanks to the just-released Economic Report of the President. Here are some excerpts from the socialism chapter (begins on page 381), including some analysis about how to define the term. …economists generally agree about how to define socialism, and they have devoted enormous time and resources to studying its costs and benefits. …we review the evidence from the highly socialist countries showing that they experienced sharp declines in output, especially in the industries that were taken over by the state. We review the experiences of economies with less extreme socialism and show that they also generate less output, although the shortfall is not as drastic as with the highly socialist countries. …Whether a country or industry is socialist is a question of the degree to which (1) the means of production, distribution, and exchange are owned or regulated by the state; and (2) the state uses its control to distribute the country’s economic output without regard for final consumers’ willingness to pay or exchange (i.e., giving resources away “for free”). …we find that socialist public policies, though ostensibly well-intentioned, have clear opportunity costs that are directly related to the degree to which they tax and regulate. The chapter looks at totalitarian forms of socialism. …looking closely at the most extreme socialist cases, which are Maoist China, the USSR under Lenin and Stalin, Castro’s Cuba… Food production plummeted, and tens of mil-lions of people died from starvation in the USSR, China, and other agricultural economies where the state took command. Planning the nonagricultural parts of those economies also proved impossible. …Venezuela is a modern industrialized country that elected Hugo Chávez as its leader to implement socialist policies, and the result was less output in oil and other industries that were nationalized. In other words, the lessons from socialized agriculture carry over to government takeovers of oil, health insurance, and other modern industries: They produce less rather than more. …A broad body of academic literature…finds a strong association between greater economic freedom and better economic performance, suggesting that replacing U.S. policies with highly socialist policies, such as Venezuela’s, would reduce real GDP more than 40 percent in the long run, or about $24,000 a year for the average person. For what it’s worth, the International Monetary Fund published some terrible research that said dramatically reduced living standards would be good if Americans were equally poor. So I guess it makes sense that Crazy Bernie endorsed Venezuelan economic policy. But I’m digressing. 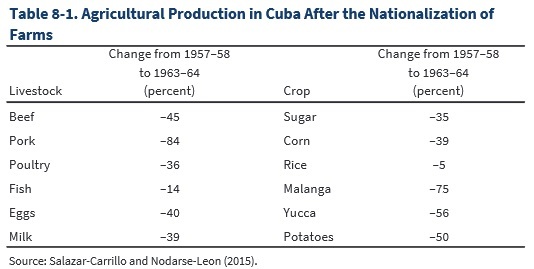 Let’s get back to the contents of the chapter, including this table that shows the collapse of agricultural output in Cuba following nationalization. The chapter also looks at what is sometimes referred to as “democratic socialism” in the Nordic nations. These countries don’t actually practice socialism since there is no government ownership of the means of production, no central planning, and no government-dictated prices. But they do have bigger government, and the report echoes what I said in the interview about this leading to adverse consequences. …the Nordic countries’ policies now differ significantly from policies that economists view as characteristic of socialism. 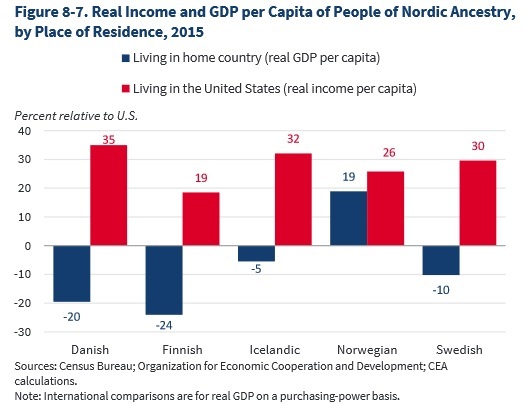 …Nordic taxation overall is greater… Living standards in the Nordic countries, as measured by per capita GDP and consumption, are at least 15 percent lower than those in the United States. …a monopoly government health insurer to provide healthcare for “free” (i.e., without cost sharing) and to centrally set all prices paid to suppliers, such as doctors and hospitals. We find that if this policy were financed through higher taxes, GDP would fall by 9 percent, or about $7,000 per person in 2022. The report notes that Nordic nations have cost sharing, so the economic losses in that excerpt would apply more to the British system, or to the “Medicare for All” scheme being pushed by some Democrats. But Nordic-style fiscal policy is still very expensive. It means higher taxes and lower living standards. I’ve previously shared AIC data, so regular readers already know this data. And regular readers also won’t be surprised at this next chart since I wrote about Nima Sanandaji’s work back in 2015. Here’s the bottom line from the report. Highly socialist countries experienced sharp declines in output, especially in the industries that were taken over by the state. Economies with less extreme forms of socialism also generate less output, although the shortfall is not as drastic as with the highly socialist countries. In other words, lots of socialism is really bad while some socialism is somewhat bad. Let’s close by citing some other recent publications, starting with this editorialfrom the Wall Street Journal. Democrats are embracing policies that include government control of ever-larger chunks of the private American economy. Merriam-Webster defines socialism as “any of various economic and political theories advocating collective or governmental ownership and administration of the means of production and distribution of goods.”…consider the Democratic agenda that is emerging from Congress and the party’s presidential contenders. …Bernie Sanders’ plan, which has been endorsed by 16 other Senators, would replace all private health insurance in the U.S. with a federally administered single-payer health-care program. Government would decide what care to deliver, which drugs to pay for, and how much to pay doctors and hospitals. Private insurance would be banned. …The Green New Deal…, endorsed by 40 House Democrats and several Democratic presidential candidates, would require that the U.S. be carbon neutral within 10 years. …this would mean a complete remake of American electric power, transportation and manufacturing. …as imagined by Rep. Alexandria Ocasio-Cortez, all of this would be planned by a Select Committee For a Green New Deal. Soviet five-year plans were more modest. The column also mentions government-guaranteed jobs, Washington imposing controls on businesses, and confiscatory tax rates, all of which are terrible policies. Whether this is technically socialist can be debated. What can’t be debated is that this agenda would make the U.S. – at best – akin to Greece in terms of economic liberty. Here’s a look at some excerpts from a column in the Weekly Standard. Most interesting, we also have a column by Cass Sunstein, a former Obama appointee. President Donald Trump was entirely right to reject “new calls to adopt socialism in our country.” He was right to add that “America was founded on liberty and independence — not government coercion,” and to “renew our resolve that America will never be a socialist country.” …socialism calls for government ownership or control of the means of production. By contrast, capitalism calls for private ownership and control — for a robust system of property rights. In capitalist systems, companies and firms, both large and small, are generally in private hands. In socialist systems, the state controls them. …Socialist systems give public officials a great deal of authority over prices, levels of production and wages. …Whether we are speaking of laptops or sneakers, coffee or candy bars, umbrellas or blankets, markets establish prices, levels of production and wages on the basis of the desires, the beliefs and the values of countless people. No planner can possibly do that. …Those who now favor large-scale change should avoid a term, and a set of practices, that have so often endangered both liberty and prosperity. Last but not least, here’s a video about socialism. Narrated by Gloria Alvarez, it looks at the grim evidence from Cuba and Venezuela. And she also points out that Nordic nations are not socialist. Indeed, most of them would be closer to the United States than to France on this statism spectrum. In other words, the real lesson is not that socialism is bad (that should be obvious), but rather that there’s a strong relationship between national prosperity and economic liberty. Simply stated, the goal of policy makers should be to reject all forms of collectivism (including communism and fascism) and instead strive to minimize the footprint of government.